Thanks for all the cat stories and comments last week. Now the evenings are slowly getting lighter the little beggars have abandoned their camouflage and no longer shadow me up the path; instead when I get to the door they seem to just materialise out of thin air directly between my ankles, as if the Enterprise’s ship’s cats had learned how to work the transporter—the only warning being what I used to think of as a plaintive meow, but which I now believe to be the sound a cat-sized quantity of air makes when it is displaced. I have—hurrah—finished the collar of the gansey, which consists of an inch of knit 2/ purl 2 ribbing, cast off in pattern. So that’s the body substantially complete, and just the sleeves to go. As I’ve said before, this for me is when the gansey really starts to come together, and you feel you’re on the downhill straight; like reassembling C3PO in Star Wars, he may not have all his arms and legs yet, but you feel you could attach a head and have a conversation. The armhole is 9.5 inches high, so with a stitch gauge of 9.25 stitches to the inch that gives me about 88 stitches to pick up per side. The sleeves are going to replicate the body patterns all the way to the cuff, so that it all looks of a piece, which means the section closest to the shoulder will be the same pattern as the yoke (but necessarily shorter, so instead of three trees or anchors in a column there will just be the one). 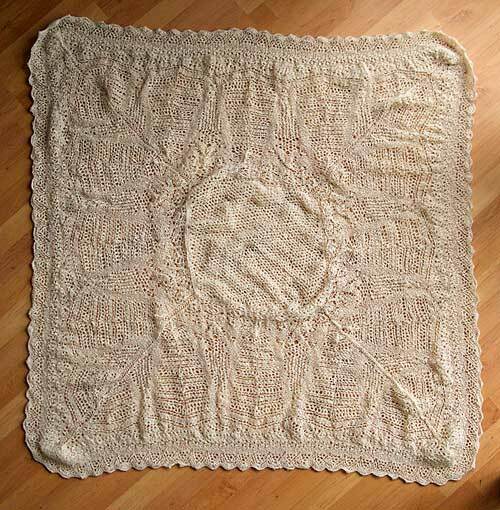 Margaret has now finished her magic shawl, fashioned from angels’ eyelashes and sea foam. When it’s stretched and blocked she’s going down to the river on midsummer eve to catch fairies with it. Judit continues to come up with fun and novel uses for leftover gansey yarn: this time it’s a delicate little mobile phone bag or case which you can see here, which is the kind of thing I imagine archaeologists would be raving about if they found in the tomb of a bronze age princess, assuming her phone was buried with her (not that you’d get much of a signal in a lead-lined coffin, of course). 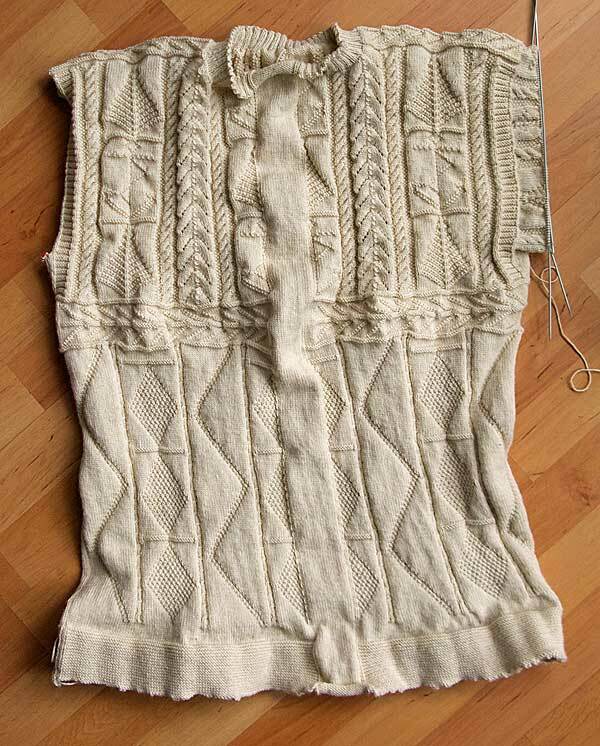 She’s also helpfully tweaked the photo of Dave’s gansey so you can see the rich complexity of the pattern more clearly, so many thanks to Judit for that. 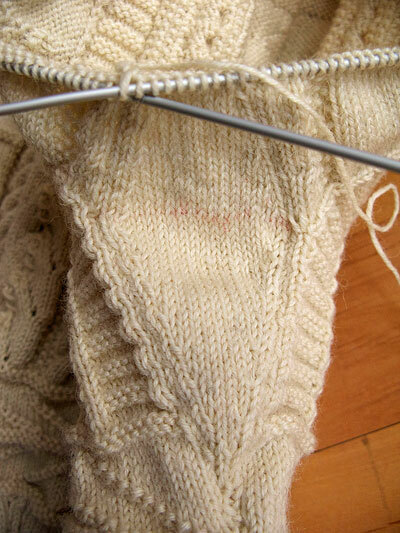 The horizontal view of the sleeves on the gansey suddenly makes the cables more noticeable than the other designs. I suppose that effect will diminish once it’s being worn and the sleeves are vertical. Re the old lady…I may or may not be fatuous, but I am definitely edging closer to being classically eccentric. I blame the fingerless mitts. I have so far resisted knitting a solid-type hap shawl out of something resembling seaboot yarn. I love Margaret’s shawl and your description of it. Tamar, I always find once the sleeves appear the whole pattern comes into focus. Once it’s blocked you’ll be able to see the moss stitch on either side of the cables better, too. As for eccentricity, I recommend carrying an umbrella and nonchalantly tripping passers-by when they’re not looking. Or getting one of those spray cans of whipped cream and the next time you’re on a crowded bus or tube train surreptitiously squirt a good measure into the pocket of the person standing next to you. As for attaching the head and having a conversation, I’m always surprised when the face of a doll I’m embroidering starts making wardrobe suggestions. Dolls, gotta watch ’em. I am testing my gauge with some 5-ply wool. I finished my Beth Brown R gansey and it turned out ok. The most fiddly bit was joining the welts. I won’t be having welts on the gansey I am knitting for myself. The 5ply is a bit like strong string. Which reminds me: My father once told me: Your mam was a great knitter. She once knitted me a string vest, it was lovely, and made out of real string! Nigel did you sent pictures to Readers Gallery ? I would like to see the Beth B-R gansey. I think the real definition of harmless eccentricity is doing whatever you damn well please regardless of what convention says “the done thing” might be – but in retrospect the umbrella and whipped cream will probably have to go, as they could upset other people. So I’d take your friend’s remark as a compliment! This gansey has two separate welts, they sort of hang like flaps front & back, and it’s fiddly but not too bad. I just prefer the way the ribbed welt draws in, so it’s the look of the thing for me – comfort be blowed! BEAUTIFUL! that’s all I have to say about the sweater and lace! What would you suggest for a beginner’s project in gansey patterns? I was thinking mother’s day is comming up and some had knit face clothes with gansey patterns. Or should I just jump in and knit a sweater? Really all hand knitters are a bit ecentric, when you can go and buy a sweater for under $20? Hi Joanne, and thank you. I’m a sweater man myself—have never knit anything else, not even a scarf—so I’m not sure I’m the best person to help you. Judit has lots of good ideas on small projects (see her gallery page here: http://www.ganseys.com/?page_id=3572). I can confirm, though, that if you do go for the sweater I would realistically aim for Mother’s Day 2014! sweaters are not in the same category with hand knitted ganseys. Is there any shop at your place where you can buy any high quality, hand knitted not “made in China” sweater for under $20 ? Dear Judit, true hand knit sweaters are far superior! Ecentric and knitting.